The Office for Equity and Diversity at the University of Utah is proud to present its 34th annual celebration of the life and legacy of Dr. Martin Luther King Jr. beginning Jan. 13. This year’s theme, Toxic: A Conversation on Environmental Racism, addresses the intentionality of environmental racism through systems and policies that regulate zoning laws, chemical and toxic waste and access to natural resources that disproportionally affect communities of color. The U’s Bennion Community Service Center is sponsoring a day of service in conjunction with a variety of local organizations, including First Step House, The American Red Cross and more. Volunteers must pre-register and arrive at their sites for check-in, breakfast and explanation of the project by 8:45 a.m. Limited registrations will be available onsite at the Bennion Center at 8:30 a.m.
March to Kingsbury Hall at 3 p.m. 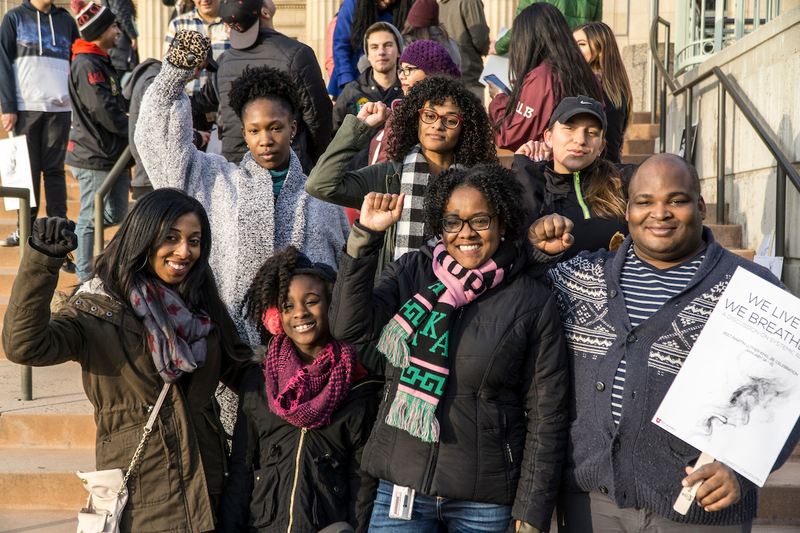 The 10th annual MLK Celebration March and Rally is one of the largest demonstrations on MLK day in Utah. The March and Rally is a way for youth, educators, businesses, organizations, religious groups and the greater community to come together and march for equality and unity. Each step marched between East High School and Kingsbury Hall is a reminder of the teachings and the impact of King and other civil rights activists. Instances of environmental disasters, contaminants or limited access to resources disproportionately affecting marginalized communities of color are symptoms of racist practices and policies. To discuss national cases, Ivis Garcia-Zambrana, assistant professor of city and metropolitan planning, will moderate a discussion with invited guests: Robert Bullard, distinguished professor of urban planning and environmental policy at Texas Southern University; Tara Houska, tribal rights attorney and national campaign director for Honor the Earth; and Nayyirah Shariff, community political organizer in Flint, Michigan, and co-founder of the Flint Democracy Defense League. The discussion will be followed by a Q&A session, where the audience will be able to submit questions to the panelists electronically. Parking will be available at the Stadium Parking Lot, across the street from the Law Building. Franci Taylor, director of the American Indian Resource Center at the U, will facilitate a conversation on environmental racism in Utah. Panelists include Rebecca Hall, attorney and community activist; Carl Moore, co-founder of PANDOS (Peaceful Advocates for Native Dialogue and Organizing Support) and chair for SLC Air Protectors; Victor Puertas, community activist for Utah Tar-Sands Resistance; and Adrienne Cachelin, director for sustainability education and associate professor of environmental and sustainability studies. Jacqueline Woodson is the 2014 National Book Award Winner for her New York Times bestselling memoir, “Brown Girl Dreaming,” which was also a recipient of the Coretta Scott King Award, a Newbery Honor Award, the NAACP Image Award and the Sibert Honor Award. She is also the author of New York Times bestselling novel “Another Brooklyn,” which was a 2016 National Book Award Finalist and Woodson’s first adult novel in 20 years. In 2015, Woodson was named Young People’s Poet Laureate by the Poetry Foundation. Among her many accolades, she is a four-time Newbery Honor winner, a three-time National Book Award finalist, and a two-time Coretta Scott King Award winner. For more information, contact Anne Jamison at anne.jamison@utah.edu or Lauren Liang at lauren.liang@utah.edu. All MLK Week events are free and open to the public. For more information on events, visit diversity.utah.edu/events/mlk. This event is co-sponsored by the S.J. Quinney College of Law.